KEEP YOUR PETS SAFE! KEEP THEM OUT OF FLOODWATERS. 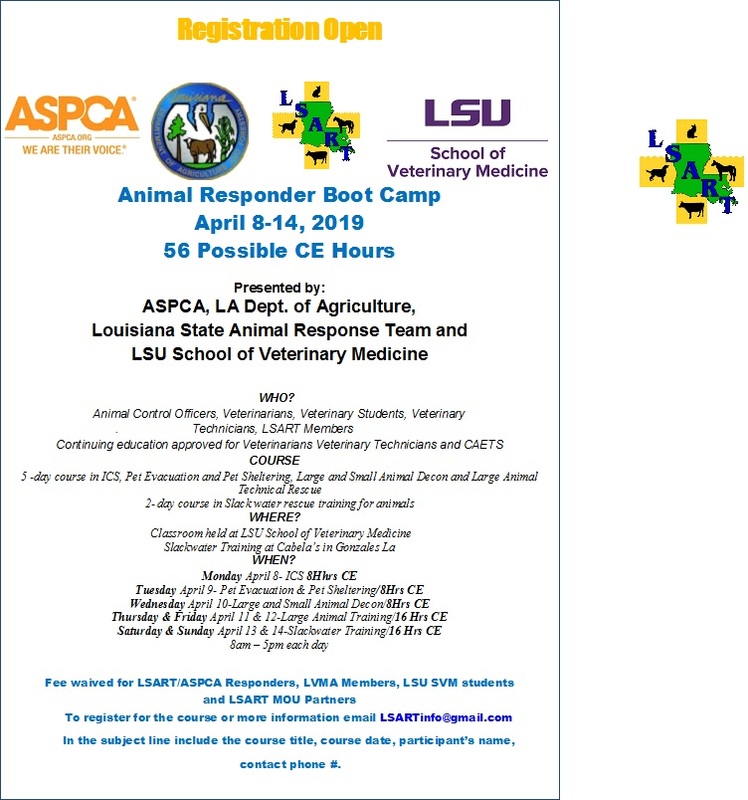 The Louisiana State Animal Response Team (LSART) developed from the Louisiana Veterinary Medical Association (LVMA) Disaster Committee. After the response to Hurricane Katrina, LSART became a division of the Dr. Walter J. Ernst Veterinary Memorial Foundation (WJE). WJE is the non-profit foundation associated with the LVMA. LSART is an organization of groups and individuals with an interest in animal well-being related to emergencies or disasters. Veterinarians, animal control officers, humane organizations, and citizen volunteers make up LSART's membership list. Makes resources available to parishes for emergency planning, response and recovery. Assists local jurisdictions in planning and preparing for all types of emergencies involving all animals. Registers teams of volunteers in companion animal, equine and food animal sections. Provides training in NIMS, ICS, evacuation protocols, shelter management and other aspects of emergency planning. Provides community public information and messaging for emergency preparedness. Responds to emergencies by assisting with evacuation, sheltering, and search and rescue. or care for the animals in their care in event of an emergency. Please see our animal owners page for tips on getting prepared! LSART does not respond outside of the state/federal system. We work with them and fulfill request that they have received. 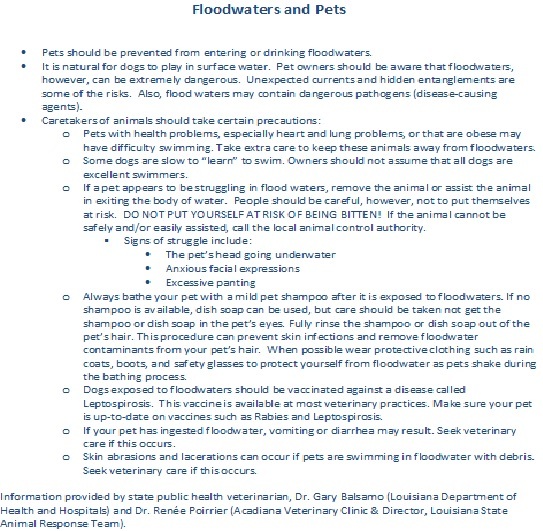 You should always contact your Parish Office of Emergency Preparedness, animal control(or your sheriffs office for the 27 parishes with no animal control), and then the Louisiana Department of Agriculture and Forestry. LSART responds to request that these agencies make for assistance. This helps keep responses organized and efficient.